Expanding discharge options would be risky though, given all we are still learning about the chemicals in wastewater, potential toxicity, treatability and potential health risks. The Environmental Protection Agency (EPA) will soon release a study of discharge practices, including the pros and cons of current regulations. States like New Mexico and Oklahoma are also working with EPA to better define their own authorities and options. 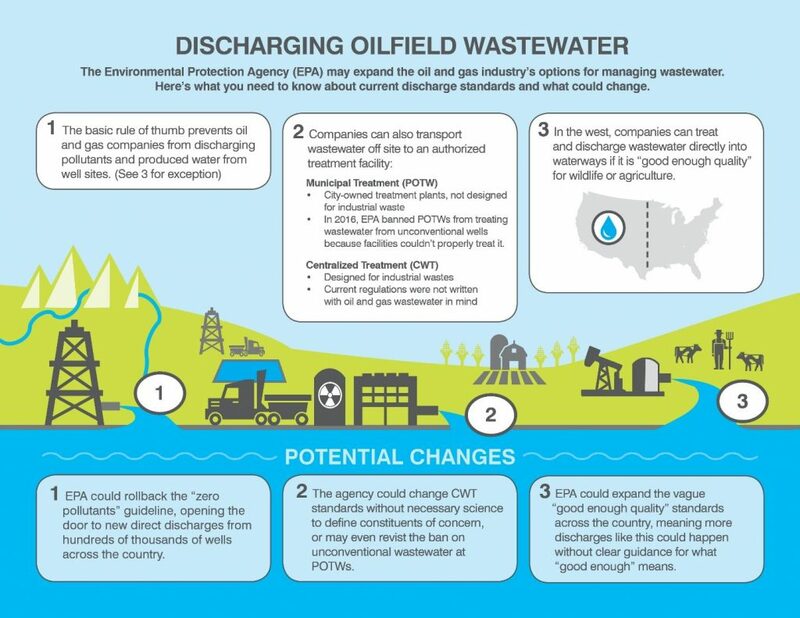 As states and EPA consider what a future for produced water discharge might look like– it’s important to know what the standards are today. What do the current rules say? The Clean Water Act requires a permit to discharge pollutants into waterways. The key permitting program — the National Pollutant Discharge Elimination System (NPDES) — looks at both the capabilities of treatment technologies as well as water quality objectives in order to determine what kind of permit is appropriate. The technology aspect, also known as “effluent limitation guidelines” (ELGs) can vary from industry to industry based on the ability of treatment technologies to remove constituents of concern to acceptable levels. EPA’s study of the technologies and pollutants for an industry results in an ELG that sets the national baseline for discharge permits. The main ELG for oil and gas facilities sets a baseline of “no discharge” of pollutants into navigable waters of the United States. In 2016, the EPA went further, and prohibited companies who operate “unconventional wells” from disposing of their wastewater into municipal treatment systems, known as Publicly Owned Treatment Works (POTW), since these city-owned facilities are not designed to handle this type of industrial waste. A well that produces less than 10 barrels of oil a day (also known as a stripper well) also doesn’t have to follow these guidelines. The ELG’s are not the final word, though. As a complement to the technology standards, states also have the power to determine how clean they want their water to be by setting their own water quality based guidelines. This allows states to monitor and limit particular pollutants of concern to protect certain qualities or uses of their water bodies. When permit writers are developing a final NPDES permit, they will consider both the baseline technology standard and the water quality standard that applies to the receiving water body and develop requirements based on both standards. This is important to keep in mind. Even if EPA were to modify the technology standards, states have an opportunity to chime in to address any risks they may see for their water bodies with modifications to their water quality standards. Clean water protections are extremely complicated. And as we learn more about the chemicals used in hydraulic fracturing, as well as the pollutants that may naturally come up from underground, we are also learning our existing standards may be ill suited for the massive volume of chemical-laden wastewater generated in the oilfields. or reconsider the standards for CWTs. What we do know is that there is a lot to be concerned about given limitations in our understanding of the complete range of pollutants that might be in this wastewater – a challenge EPA’s own experts have acknowledged. Permits that allow for the discharge of this wastewater must – definitively – be written to ensure that human health, water resources and ecosystems are protected, and that is going to require work. If anything, these historic rules need to be strengthened, not made weaker. This entry was posted in produced water, Water and tagged oil and gas. Bookmark the permalink. Both comments and trackbacks are currently closed.